Caraselle Direct – Home Accessories Products Stain remover is ideal product for removing wine strain. 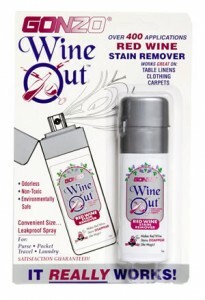 Wine Stain Removers To The Rescue! Christmas and New Year now being behind us, some may find that their house isn’t looking quite as good as it did before the festivities! Indeed if you are one of the many people who have discovered wine stains on your carpet don’t do the classic ‘cover up’ (with a rug or such like!) There are some great stain removers for this sort of situation, such as Gonzo Red Wine Out Stain Remover. Indeed the ideal solution would be to have a bottle to hand BEFORE especially for such emergencies thus saving a lot of panic! Nevertheless Wine Out is a multi-purpose product, which doesn’t smell and is non-toxic. It can remove Red Wine stains from many types of clothing, carpets, upholstery & many other areas where stains might show up. Because of its unique formation it is effective on almost all Red Wine stains. It can be used as a laundry pre-wash, or an instant spot remover, allowing garments to be worn immediately after spots have been removed. It is most effective when applied to freshly made stains, but when red wine has spilt you can mop it up with salt and leave it for 30 minutes. You can also pour some white wine on it to neutralise it and you can dab it with some bleach product (but not if it is spilt onto any colour other than white) but best of all keep a bottle of Gonzo Wine-Out in your cupboard. So save tears next time this happens (which it will!) and reach for the Gonzo Wine-Out! Available in a 12oz large bottle and 1oz handy spray. 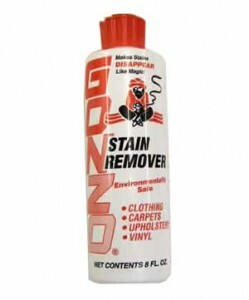 If you have other stains which have appeared, such as ballpoint ink, blood, milk, tea, coffee and more Gonzo Multi-Stain Remover is an odourless, non-toxic and non-flammable stain remover which works hard to make stains disappear like magic! With simple instructions it’s easy to use!